“A smart grid is an intelligent, digitized network delivering electricity in an optimal way from source to consumption. This is achieved by integrating information, telecommunication, and power technologies with the existing electricity system.” It has self-healing capabilities to correct problems and maintain resilience and reliability, and, like the internet, a smart grid enables multiple users and applications to operate simultaneously with relative ease, while making the infrastructure and distances involved largely transparent. It minimizes losses and improves efficiency, delivering a higher percentage of the power generated to customers. According to recent studies, a smart grid could decrease worldwide carbon emissions by 5–16%. It also employs advanced metering infrastructure (AMI) and variable electricity pricing, giving customers information and motivation to monitor and control their usage. A smart grid is more than advanced metering in homes. It is not a mechanism to allow utilities to control their customer’s power consumption or obtain personal information about customers, and the benefits to consumers go beyond remotely controlling devices in their homes. The primary intent of the smart grid is to improve grid reliability and peak power demand resiliency while reducing transmission losses. This will save energy and cut costs for utilities and consumers. Why is a smart grid needed? Nationwide, our electric grid system has lagged behind growth in demand for electricity—demand increased about 25% from 1990 to 2009. It has been projected to grow by less than 1% per year through 2020, then at a more rapid rate, potentially increasing 29% by 2040. In Florida, total energy consumption is projected to grow 39% by 2030. Accelerated construction of high voltage transmission lines is planned to integrate new energy generation; new urban low-voltage lines are often experiencing permitting delays. Although investment in transmission lines has increased in the last decade, power interruptions and failures have increased, in part due to inadequate maintenance, and severe weather. Electricity generation with conventional fossil fuels adds to air pollution, produces greenhouse gasses and accounts for about 40% of the total US carbon footprint. A smart grid has the potential to provide significant energy efficiencies, reducing our need for additional generation capacity, and it could cut up to 25% of US carbon emissions. Our electricity grid usually works well, but we take for granted that it always will. A gap between development of transmission infrastructure and growth in electricity use in over several decades saw an increase in the number of major power outages nationwide. 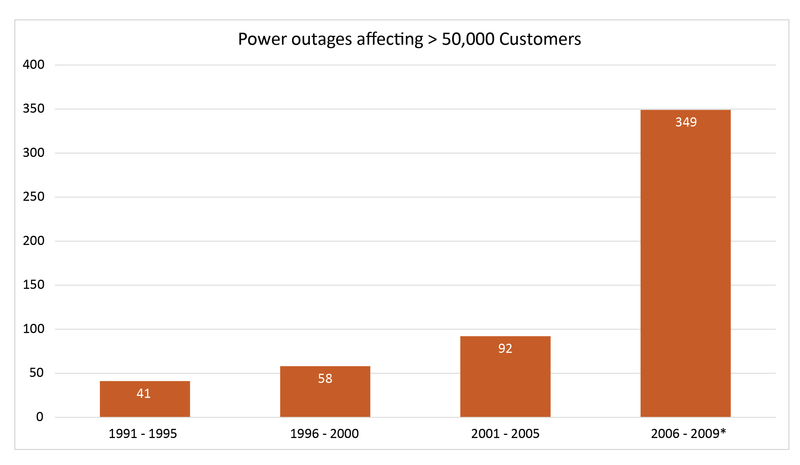 Between 1991 and 1995 there were 41 outages that affected more than 50,000 customers, growing steadily to 349 similar outages between 2005 and 2009, as shown in Figure 1. Since the mid-2000s investor-owned utilities have rapidly increased spending on transmission infrastructure, from around $5 billion in 2004 to about $14 billion in 2012. These expenditures should improve system reliability, but additional improvements are needed. In 2008 the Edison Electric Institute estimated that about $900 billion was needed by 2030 to modernize the transmission and distribution grid. When faults occur, an outage in a small area can cascade into a regional blackout or brownout when power cannot quickly be re-routed or operators have insufficient data or situational awareness to monitor and correct imbalances in the transmission system. Historically, utilities have depended on customers to call them to report power outages, but a large number of utilities now have outage management systems that quickly indicate the existence and location of problems to system operators. Additional sensing and automation with smart grids will enable power irregularities to be corrected quickly to minimize the extent of outages or prevent them entirely. These and other new components, such as solid-state switches, circuit breakers and relays may make a ‘self-healing’ grid system a reality. On average, past power failures cost Americans at least $150 billion per year—about $500 per person! Full deployment of the smart grid should significantly reduce these costs. Power outages are more than an inconvenience. Nearly every crucial segment of modern society depends on reliable power. Some that we likely take for granted are: the internet and other communications, transportation, business and financial transactions, pumping systems for our water and fuel pipelines, and security systems. Our electric grid is potentially vulnerable to deliberate attacks, human error, mechanical malfunction, cyber-attacks and magnetic variations from solar storms. Utilities recognize the risk to power generation facilities, and all utilities with a capacity > 300MW have security regulations. However, many components of the smart grid can be at risk. Cybersecurity is being considered as new technologies are developed and deployed, as well as added to system operations and maintenance and training programs. For emerging smart grid architecture, building security into the design is imperative. Research and development of national standards to improve cybersecurity are continuing as well as efforts in the US Congress to assess and protect critical infrastructure, including the national electric grid. Many technologies must be combined to create a smart grid. Smart meters receive the most attention from the public, but they are just one part of an interconnected system. Numerous other components are also in the process of design, development and implementation. A few examples include: advanced communication and control systems, new types of conductors, and various types of distributed electricity generation. Full implementation of the smart grid will take many years, but these and other important technologies collectively bring substantial potential for a more flexible and resilient electric power system. Existing sensors on our high-voltage grid typically provide measurements for grid operation and control in one direction every 2–4 seconds. A few seconds is all it takes for a disruption in distribution to cause rolling blackouts. In their place, Phasor Measurement Units (PMU) or synchrophasors, are being deployed in greater numbers to monitor voltage, current, frequency, phase angle and various environmental conditions at a rate of 30 times per second. In addition, these measurements are GPS-synchronized to provide a precise awareness of the state of the grid over a wide area at any instant in time. The PMUs and other sensing devices allow operators to detect, locate, and correct irregularities quickly. In some situations, power can be rerouted automatically to prevent outages. In addition to improving the reliability of the grid, increased information provided by new sensors will enable greater efficiency in electricity delivery, enabling higher utilization of existing lines. The smart grid relies heavily on data collection and communication and control systems. To achieve this, a more sophisticated information infrastructure must be integrated into the existing power infrastructure. Wireless telecommunication systems on dedicated wavelengths and radio frequencies are a leading option to become the standard to transmit data from the new sensors and communicate with various electronic devices. It will also include wired communications (fiber-optic, powerline). The mix of existing commercial communications infrastructure and dedicated communications systems must be compatible to provide the security and control needed. Dozens of voluntary standards have been developed for many grid components, with others in development. Our existing high-voltage transmission lines already use some smart grid technology to manage and route electric flow between major power plants. However, measurement and control technology to facilitate two-way flow and greater flexibility and automation must be extended out through the distribution systems of more than 3,000 utilities nationwide. Reducing peak power demand is an important part of a smart grid. To understand the benefits of this, you need to first understand that electricity is an instantaneous commodity—generally it must be used as it is generated. Customers expect that power will always be there when needed. Utilities can anticipate the overall pattern of consumption, but for most, fluctuations in demand mean they must keep excess generation equipment in “spinning reserve” in the range of 8 to 16%. This consumes electricity unnecessarily. A smart grid will allow them to better match supply and demand and possibly cut these losses in half. Demand response programs encourage customers to lower their demand during hours when electricity consumption is high. Figure 2. Typical Florida daily electricity demand in summer and winter. [Click image for full size version.] Original graph courtesy of the Florida Public Service Commission. Critical peak pricing is one of several rate structures utilities employ in demand response programs. They charge higher prices when demand is high to reduce usage. Utilities also recoup some of the extra expenses they incur for construction and maintenance of generation capacity and transmission systems necessary to meet peak power demands. Typically, critical periods occur only 1-2% of the hours per year, yet the infrastructure must be maintained to supply it. “Our whole system is engineered for these peak periods, and about 20 percent of the entire grid capacity exists only to manage a few hours a year of peak load. If you could spread out that peak load, you could get far more from existing infrastructure,” states George Arnold, National Coordinator of Smart Grid Interoperability at the National Institute of Standards and Technology (NIST). Figure 2 illustrates daily demand variation in summer and winter in Florida. In 2007, about 2.2 million residential customers in the U.S. had AMI smart meters, allowing 2-way communication with their utility, increasing dramatically to more than 46 million residential customers by the end of 2013,  and about 65 million (54% of households) were expected to have smart meters by 2015. To save money with AMI, customers must take advantage of time varying utility rates to operate thermostats, equipment and appliances in their home or business at optimal times. For example, washing laundry in the evening uses less expensive electricity than during afternoon peak periods, and the customer benefits from lower evening rates when time varying rates are in place. Some citizen groups have opposed smart meters on several grounds. Concerns are understandable, and each issue is briefly addressed below. Privacy—Will smart meters allow others to obtain personal information about occupants? Health—Are the electromagnetic fields created by radio frequency meters harmful? Control—Will customers lose control over items such as their refrigerator or air conditioning in their homes? Costs—Are smart meters cost effective and will they result in higher rates for most customers? Fairness—Will low-income customers be unable to reduce consumption and be disadvantaged? Privacy: Only encrypted data is transmitted by utility companies, who must comply with state regulatory commission requirements. A set of cybersecurity and privacy guidelines was issued in 2010 by NIST and are a continuing concern. Updates will be developed with the Department of Energy and the Department of Homeland Security. Health: Smart meters communicate through low-power radio waves. In normal operation they emit a signal for less than one second every 4-6 hours, far less than cell phones, microwave ovens or even baby monitors. No adverse health impacts have been identified. Control: Customers must consent to direct load control programs that allow utilities to control individual devices (such as a thermostat setting) in a home in exchange for a reduced rate. Generally the off periods are brief, and most customers don’t notice the difference. But, the aggregated demand and cost savings can be significant. Costs: Cost savings from smart meters are variable and changeable over time. It may be difficult to justify the cost of smart meters based solely on the savings individual consumers observe on their electricity bills. And, not every customer will see decreased bills—this will depend on the pricing structure and customer behavior. Some utilities structure rates to offer discounts to customers who reduce peak consumption, rather than increasing peak rates. Avoided costs and other factors affect observed savings. Rising fuel or equipment costs to utilities may be passed along, offsetting customer savings. It is also hard to estimate how much energy was not used. Finally, the avoided costs of additional generating plants and other infrastructure that would have been needed without smart meters will be invisible to customers. Still, avoided costs are a long-term benefit of smart meters. Fairness: Another concern is that low income households will not be able to shift their usage and will pay higher bills. Dynamic pricing should result in lower bills for 50% of customers without any behavior changes. Pilot studies have shown about 65% of low income customers have immediate drops in their monthly bills, as typically they are not large users of electricity and revised rate structures are less expensive for lower usage. People at all income levels have the ability to make some changes to their behavior. Although we are used to paying a set price for electricity, we have become accustomed to variable pricing from airlines, phone companies and sports teams. Variable energy pricing is often accepted when adequate education is provided to customers before introducing new meters. Many studies show that better educated consumers do use information to reduce their power consumption. In 2010 the American Council for an Energy-Efficient Economy (ACEEE) reviewed 36 programs that offered feedback in varying levels of detail to customers. The results are shown in Figure 3. The most general feedback, enhanced billing (specific information is given to each household with advice to reduce consumption) saved the least. As information became more accurate, detailed and timely, customers were better able to use it to reduce consumption. Whether smart meters should be opt-in or opt-out for utility customers is an unresolved issue at present. In some states, utilities are charging customers extra fees if they opt to continue with mechanical meters. The reason is that staff must be employed to drive around and read a small percentage of meters, increasing the cost per meter. A few utilities are delaying implementation of smart meter programs, wanting to avoid customer backlash at the new technology. Demonstrated cost savings and better education is needed to gain full public acceptance. The electric grid was built to transmit power in one direction—from large, centralized power plants to many points of use. With small-scale renewable power, the system must transmit power from many producers distributed throughout the system and route it as needed. The variability of wind and solar power require a fast response and, therefore, advanced automation and control techniques to efficiently integrate them into the grid. New approaches are being developed, with increasing interest as the amount of renewable energy generated accelerates worldwide. The type of controls used affects both the efficiency and reliability of wind turbines and solar generating plants. Better controls have the potential to lower the cost of power production from renewables and extend their useful operating periods, therefore increasing their viability and accelerate their incorporation into the US energy portfolio. Batteries—many new types of batteries are being developed to store more power in a smaller space. Capacitors—new types of capacitors have been developed and continue to be improved. They are capable of storing and releasing large amounts of energy, known as super-capacitors and ultra-capacitors. They can provide a great deal of energy in a short time or when reactive power adjustment is needed in AC systems. Flywheels—rotating disks that spin very fast on special bearings, storing excess electric power as kinetic energy. Compressed Air Energy Storage (CAES), which takes advantage of off-peak excess power to store air under pressure in industrial tanks or below ground in caves, old mines, or porous rock formations until needed to meet peak power demand. Pumped Storage—is usually used with hydroelectric power plants in locations with a significant difference in elevation nearby. Water is pumped up to a reservoir at the higher elevation when excess capacity is available, and at times of peak demand, the energy is recovered by releasing it to flow back by gravity through turbine generators. Superconducting Magnetic Energy Storage (SMES)—these devices store energy in a magnetic field, made more efficient and compact with the use of superconductors. Our grid system is aging and technologically similar to what it was in the 1920s. In 2010, the additional cost of upgrading the entire grid was estimated by the Electric Power Research Institute (EPRI) to fall between $338 and $476 billion. This includes transmission and distribution systems, consumer costs and integration of renewable energy sources, but excludes the cost of generation and expansion of the grid to meet load growth over the next 20 years. The EPRI also estimated benefits that range from about $1,300 to $2,000 billion, which is 2.8 to 6 times more than the costs. The benefits come primarily from energy savings and avoided expenditures for maintaining and enlarging our existing grid. If amortized over a 10 year period, an average residential customer could expect to pay an extra $9–$12 per month. Costs will not be evenly distributed throughout the country, so some areas will pay more and others pay less. However, the high rate of return will still mean that all will benefit in the longer term. Estimates of reduced energy consumption from the smart grid vary greatly (12%–58% by 2030), but all equate to substantial reductions in CO2 emissions from power plants. The difference in needed investment to develop the smart grid and what the industry currently projects to be spent totals about $673 billion by 2020, or about $75 billion additional per year. While a large amount, it is consistent with our annual expenditures on the system over the last 10 years. If we choose not to invest in further upgrades, our economy will likely face higher costs for power, losses incurred from more outages, and additional industrial costs and loss of competitiveness. As a result, one study projects that by 2020 national GDP would decline a total of $496 billion, with about 529,000 fewer jobs expected. Florida Power and Light (FPL) (Miami area) undertook a comprehensive project including installation of distribution automation systems, PMUs and other transmission system monitoring and control, smart meters, and a demand pricing structure for more than 3 million customers. They have been able to reduce costs while improving service reliability, power quality and customer satisfaction. The City of Tallahassee implemented an automated demand response (DR) program with time based rates for residential and commercial customers. They can notify customers about expected peak power demands, allowing voluntary reduction in usage and rebates or price reductions for those who participate. The DR program is predicted to reduce peak power by 35 MW. Smart metering and programmable communicating thermostats provide greater control of electricity bills for residential customers. Upgrades to the distribution system will automate grid monitoring and control and are expected to improve distribution efficiency and reliability while reducing power outages. JEA (located in Jacksonville) installed AMI metering, customer information software, and a new communications system, replacing on-site meter reading. Voluntary time-of-use rates were implemented, along with web portals for all residential customers, allowing greater control over their charges for electricity. A two-way communications network throughout their service area allows power disturbances to be monitored remotely in real-time, improving reliability of the grid and reducing response times when problems occur. Lakeland Electric has initiated variable peak pricing and is installing smart meters, in-home displays and a web portal for all 122,000 customers to provide information and the ability to manage their usage and rates. A point to point radio network is being used to convey data throughout the grid and improve their outage management system. The City of Leesburg included customer education with new advanced metering, home area networks, in-home displays and programmable communicating thermostats. The distribution system employs automated communications and control equipment to reduce outages and improve energy efficiency in the distribution system. The City of Quincy is installing new sensors and systems to monitor and control power distribution: smart meters for 2-way communications, a web portal for customers to monitor their electricity usage, demand response programs for all customers and thermostats capable of 2-way communication and automatic cycling. Progress Energy is piloting time-based electricity rates and installing direct load control devices to reduce peak loads, total energy use, and defer additional capacity construction. Smart meters and a web portal for customers have been installed, along with AMI communications systems, automation equipment and controls to reduce energy losses in distribution lines, as well as fewer power outages. Up to 600 charging stations for electric vehicles have been installed in Florida and the Carolinas. Qualcomm Atheros, Inc. (project in Orlando) is supporting a range of smart grid functions for home area networking, including smart meters, internet connected appliances and other devices, electric vehicles, and advanced metering infrastructure (AMI), through development of a new power line communications (PLC) integrated circuit. They are reducing manufacturing and installation costs as well as energy consumption. The device will integrate with existing IP-based networks and will include a power-saving “sleep” mode on the circuit. Gateway to Power Consortium (G2P) developed training for all levels of electric power industry personnel to design, build, operate and maintain smart grid infrastructure and communication systems. Seven colleges and universities (4 in Florida: Florida Atlantic University, Florida International University, Indian River Community College, and Palm Beach Community College) participated in developing and teaching courses leading to university-level certificates and degrees. The Consortium was administered by Florida Power and Light and Smart Energy Grid Associates. Smart grids are needed to maintain stability, improve efficiency and security of our national grid system and reduce peak demand loads. They are being implemented gradually, and while they require a significant initial investment, long-term cost savings and other benefits have been proven. Further development of sensors, fault detection, diagnostic and self-healing systems, communications and international interoperability standards are needed. Many competing technologies are being developed, and more work is needed to identify the most reliable, secure, cost effective means to fully implement a smart grid. Privacy protection and security issues must be continually considered and incorporated. Just like cybersecurity, there is no doubt that, even with advanced security schemes, there will always be a race between attackers and defenders, rendering smart grid safety an ongoing process. The complex structure of the utility industry results in uneven smart grid implementation. Utilities may be rural electric cooperatives, public utility districts, municipal utility districts, or they may be private companies. Some operate in competitive markets and others are regulated monopolies. Their structure and market environment as well as other factors at state and federal levels affect their investment in grid modernization. Public misunderstanding can impede smart grid adoption. The US government, the governments of many other countries, and the electric power industry are rapidly addressing these remaining problems and developing the necessary infrastructure. The potential for more efficient, reliable power distribution, integration of local small-scale renewable power sources, new products and services, as well as significant cost benefits for society, mean the smart grid is poised to become the foundation for our economy in the near future. World Economic Forum, Smart Grids Explained, video, October 2011. Palensky, Peter, and Friederich Kupzog. 2013. Smart grids. Annual Review of Environment and Resources 38: 201-226. U.S. Energy Information Administration, Annual Energy Outlook 2014. American Society of Civil Engineers, Failure to Act: The Economic Impact of Current Investment Trends in Electricity Infrastructure, p. 4, 2011. American Society of Civil Engineers, 2013 Report Card for America’s Infrastructure. John McDonald, GE Energy, A Smart Grid for Intelligent Energy Use. S. Massoud Amin, U.S. Electrical Grid Gets Less Reliable, IEEE Spectrum, January 2011. Interagency Task Force, Quadrennial Energy Review: Energy Transmission, Storage, and Distribution Infrastructure, Figure 1-4 and page 1-4, April 2015. US Department of Energy, The Smart Grid: An introduction. Electric Power Research Institute, Journal, Summer 2011, Shaping the Future. Florida Public Service Commission. Annual Report on Activities Pursuant to the Florida Energy Efficiency & Conservation Act. February, 2012. Kuhn, Thomas R., President Edison Electric Institute, Testimony to Subcommittee on Energy and Water Development Senate Committee on Appropriations, March 28, 2012. Edison Electric Institute, Understanding the Facts: Edison Electric Institute’s Positions on Radio Frequency, Cyber Security and Data Privacy. Energy.gov, Office of Electricity Delivery & Energy Reliability, Demand Response, accessed May 13, 2015. Ahmad Faruqui and Jennifer Palmer, Dynamic Pricing of Electricity and its Discontents, Regulation Magazine, October 2011. 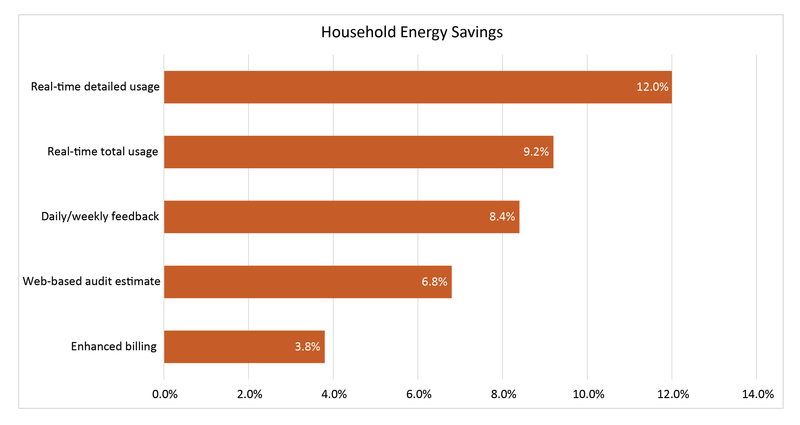 American Council for an Energy-Efficient Economy, Advanced Metering Initiatives and Residential Feedback Programs: A Meta-Review for Household Electricity-Saving Opportunities, June 2010. Eduardo F Camacho, Tariq Samad, Mario Garcia-Sanz and Ian Hiskens, (2011). Control for Renewable Energy and Smart Grids. In T. Samad and A.M. Annaswamy (Eds. ), The Impact of Control Technology. Mathias, Grid Energy Storage—CAES, Pumped Hydro and Flywheel, Energy Informative, January 2009. David Biello, Scientific American, The Start-Up Pains of a Smarter Electricity Grid, May 10, 2010. Electric Power Research Institute Technology Report, Estimating the Costs and Benefits of the Smart Grid, March 2011. American Society of Civil Engineers, Failure to Act: The Economic Impact of Current Investment Trends in Electricity Infrastructure, 2011. SmartGrid.gov, Recovery Act Smart Grid Projects, Project Information, accessed May 13, 2015. SmartGrid.gov, Recovery Act Smart Grid Project, Florida Power & Light Company, Energy Smart Florida, April 2015. SmartGrid.gov, Recovery Act Smart Grid Project, Tallahassee Automated Demand Response, November 2013. SmartGrid.gov, Recovery Act Smart Grid Project, JEA Smart Energy Project, May 2015. SmartGrid.gov, Recovery Act Smart Grid Project, Lakeland Electric Smart Grid Initiative, December 2013. SmartGrid.gov, Recovery Act Smart Grid Project, City of Leesburg, FL, Smart Grid Investment Grant Project, January 2014. SmartGrid.gov, Recovery Act Smart Grid Project, City of Quincy, FL, Smart Grid Project,, accessed June 2015. 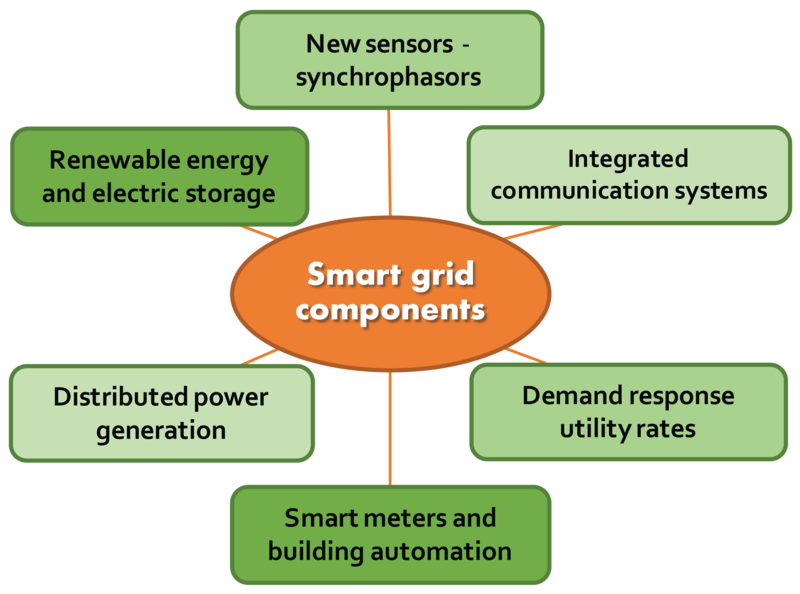 SmartGrid.gov, Recovery Act Smart Grid Project, Progress Energy, Optimized Energy Value Chain, June 2012. SmartGrid.gov, Recovery Act Smart Grid Project, Qualcomm Atheros, Inc. HomePlug Green PHY Integrated Circuit Development, June 2012. SmartGrid.gov, Recovery Act Smart Grid Project, Gateway to Power, Smart Grid Workforce Training, December 2010.